This colourful, party-party resort on the Romagna border of the Marche is in many ways an extension of the Rimini Riviera to the north. 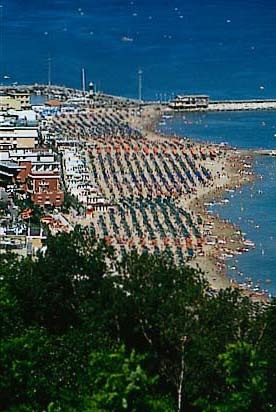 So it's not surprising that it's one of the Marche's busiest holiday spots with over a 100 hotels. Still its sandy but short strand is inviting and there is a lively night life both down by the sea and up above in Gabicce Monte. It's also just a short trip to visit the impressive castle at Gradara and, if cheap liquor and exotic postage stamps are what you're looking forward, the tiny Republic of San Marino. Heading south from Gabicce, follow the strada panoramica that heads for Pesaro. Along the winding coast road you'll have impressive views and a handful of charming coves and good-value fish restaurants - our favourite spot is the romantic little port at Baia Vallugola.